Wow, some awesome writing gains at the end of this week. This weekend alone I wrote nearly 7,000 words (nearly 10,000 for the week if I cheat and include today 5/1). When you’re hot, you’re hot. And the best part is I LOVE what I’ve written so far. Finished my book too, so I can / will get on my beta reads again. I did a few crits on Friday night / Sat AM, so I’m at least starting to work that debt off some. ETA: Corrected my stat. In my zeal to gloat about my weekend’s output, I included some of the weekdays’ writings too. 10k! That’s much better than my 0 word count for the week 🙂 And a book completed! 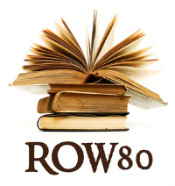 What a great ROW80 week. I think I might have written my post poorly. I meant to say I completed reading a book. If I’d finished writing one, it would have been a headliner, in 20 pt font with pictures of fireworks. LOL Thank you. I’m really proud of my word count this week. Some weeks you’re on and some you’re off. I’ve had my fair share of “off” weeks too. Cheers. 10K is fabulous! I hope you have another wonderful week. Hey, way to go Claire! 🙂 My poor little WIP and I have been struggling against the Inner Editor lately. If only she’d quiet down and let me write! Also wanted to mention I stopped by Iris’s blog and checked out the snippets of Don’t Ask… and I *really* liked it. Can’t wait to read more! Turn off that inner editor, girl!!! Just catch the wave and ride (and write)!! But you’re writing…editing or not…so good on you!